I switched to using reusable grocery bags several months ago. 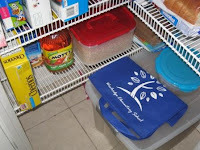 When I talk to friends and family about using these bags, a number of people have stated that they frequently forget to bring their reusable grocery bags into the store with them. Here are some tips to help you remember. Keep your bags in your car. Don’t store them in the trunk because you’ll forget that they’re there. 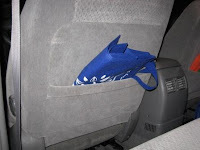 Storing them in the back seat pocket is a better option because you’ll be more likely to see them. 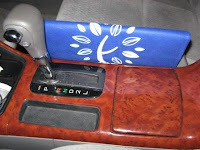 Keeping a bag slid in between the passenger seat and the center console is another option. Most of us write a list of what we need before going to the grocery store. 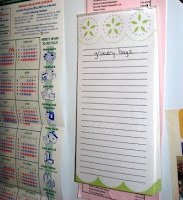 Write “REMEMBER BAGS” at the top of your grocery list each week. Use a pad of paper like in the picture and write this down on every page so you won’t forget. Hang a bag on the door knob to your garage or someplace near by. It will serve as a constant visual reminder to bring your bags with you. 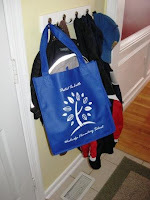 If you don’t want to hang a grocery bag, create a door tag (similar to a Do Not Disturb Tag) and hang that on the door knob. Hang a bag in your pantry. Most people check out their pantry when writing up their grocery list. Enlist your children’s help in helping you remember to bring your bags. Many local stores have programs to encourage you to use reusable grocery bags. Stores like Ukrops and Target offer a 5 cent credit for each reusable bag you use in the store. More than 510,000 tons of milk and juice cartons are generated every year in the United States, but sadly, less than .05% ever get recycled according to an EPA report of Municipal Solid Waste. Paper cartons ARE recyclable, however, “because of the wax lining, are not universally recycled. Each locality is different, depending on their recycling process capability”, says the National Recycling Coalition. Thoroughly rinse the cartons with water. Use a utility knife to cut the top and bottom off of the carton. The sharpness of the knife makes a huge difference in the accuracy and cleanliness of the cut. These cuts need to be as close to the top/bottom as possible with no more than a quarter inch of loss on the walls of the carton. This leaves the four vertical panels of the carton, all connected. Clean and wipe the panels clean. 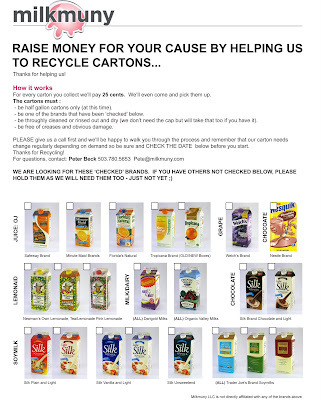 Bring the broken down cartons to work and drop them off at my desk. If anyone else out there in Moseley Nation is interested in participating in a similar fundraising program for their school, simply send me an e-mail and I will send you additional information.